Last summer I had the idea of hand-writing some of my blogposts and exchanging letters with fellow bloggers and instagrammers. My handwriting had fallen fallow and become uncertain and familiarising myself with a fountain pen for the first time since school felt wonderful. I was keen to revive the slow, largely neglected yet entirely lovely process of writing letters by hand. I’ve always loved making the shapes of letters with a pen, attended several terms of calligraphy night classes when I was still in my twenties and am an unashamed typewriter font fan. Special Elite anyone? 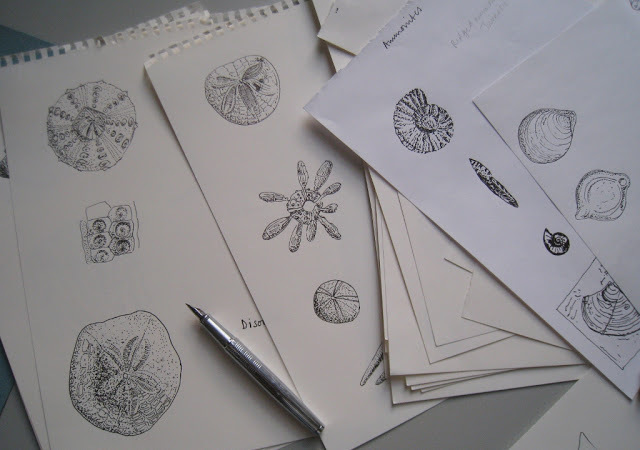 I even illustrated a couple of hundred fossils for Cambridge University’s Sedgwick Museum once (see above and here). 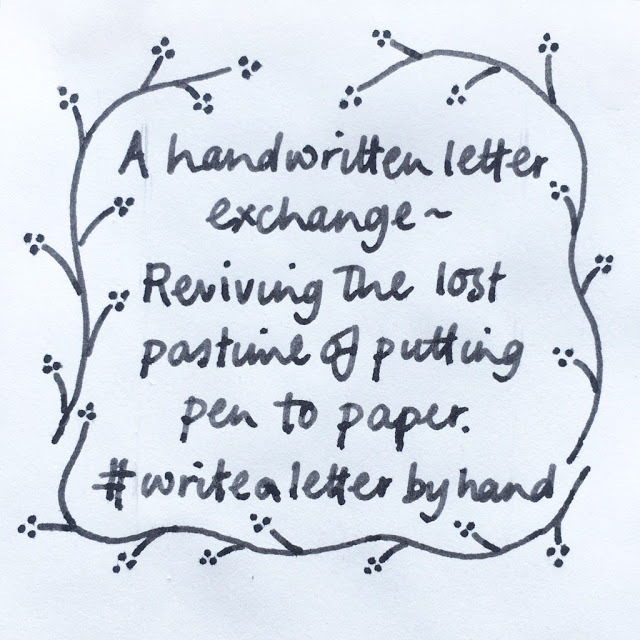 So, I asked if anyone might like to exchange handwritten letters with me. I received so many messages on Instagram, Twitter and via email that I confess I was quite startled. I knew I wouldn’t be able to write to everyone and so I let the idea lie dormant for a while (whilst being horribly haunted by inky guilt). Illustrator and Twitter pal Chichi Parish sent me a letter of such beauty that I feel it belongs in a gallery. 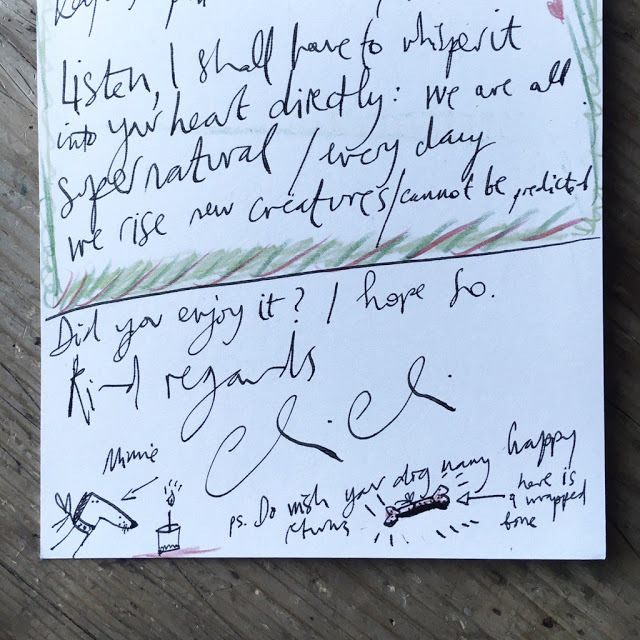 Her handwriting and use of her pen is exquisite. No wonder, as she undertakes illustration for English Heritage, The National Trust and Diva magazine. She wrote out a poem by Elaine Feinstein for me and drew little cartoons of our dog Minnie. I confess I felt almost tearful when I received these letters. Each one was an enormous treat – more special than an email, direct message, tweet or even a blog comment. 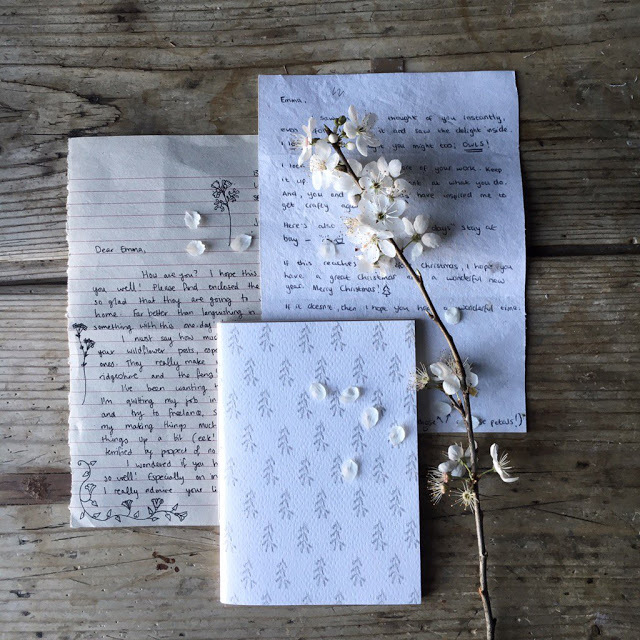 There is the aesthetic pleasure of opening the envelope and holding the crisp paper inside, but it was the thoughtful messages, little drawings and gorgeous handwriting of the person who had taken the time to write to me that made it so lovely. It was without doubt one of the highlights of 2015 for me and I was keen for it to continue. 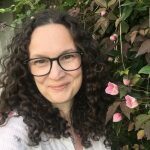 I wondered whether there might be a way to pair people up with one another and considered doing this myself with a special email address…Then I noticed Christmassy gift exchanges happening on blogs and Instagram. A clever website called Elfster (run by elves obvs) automated the process of pairing folk up for exchanging presents sent in the post. Genius. 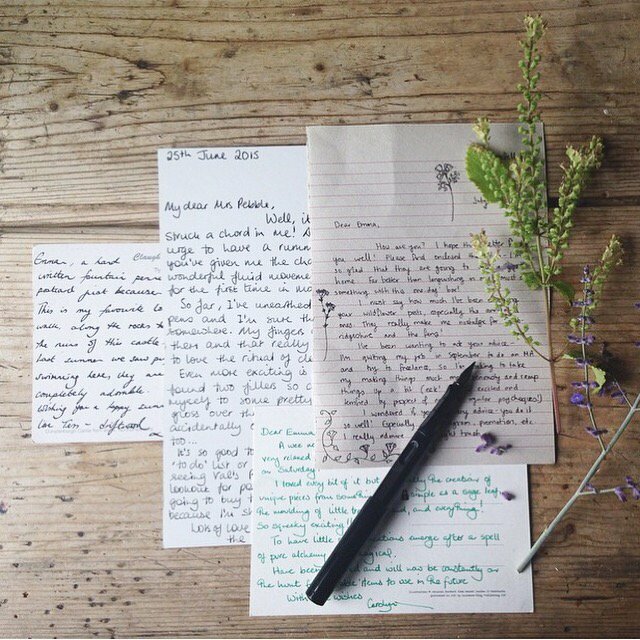 So, I have set up a handwritten letter exchange…. 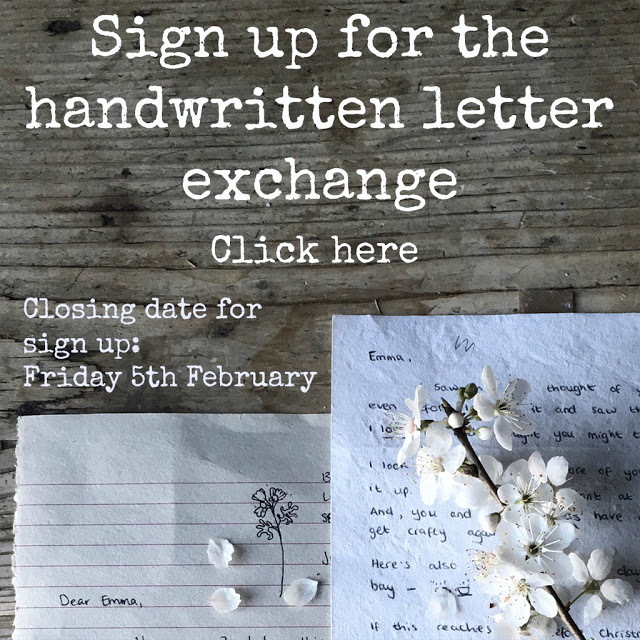 If you’d like to sign up, then after the entry closing date you’ll be allocated someone to send a letter to, and someone else will send a letter to you. This way you’ll have two potential folk to write to. If you’d like to send and receive just one letter that’s ace, but I’m hoping that some letter-writing partners may continue to write to each other for at least a little while. NB: Ignore the stuff on the website about wishlists and don’t be alarmed that this is called a gift exchange. I’m simply using Elfster’s automated pairing system for this project. 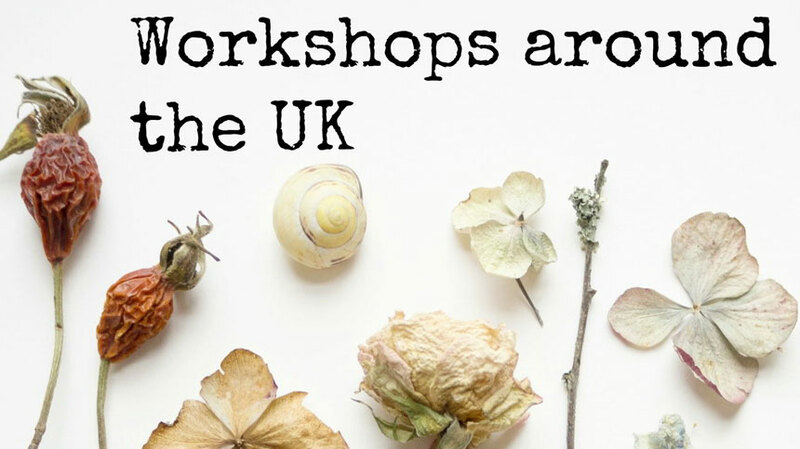 If you’d like to include seeds, pressed flowers, drawings, small handmade somethings etc in your envelopes then WONDERFUL, but this is about the pleasure of writing and receiving letters. I used to write to one of our friends during his overseas postings, and even after twenty years practice he struggles with my handwriting. One of these days I will add calligraphy to my skills and people will be able to read what I write..
A lovely idea! I'm up for a bit of letter writing. Is this intended for arty/crafty peeps? I'm not very talented in this category…. What a truly wonderful idea, have signed up immediately! Adore your gorgeous handwriting! 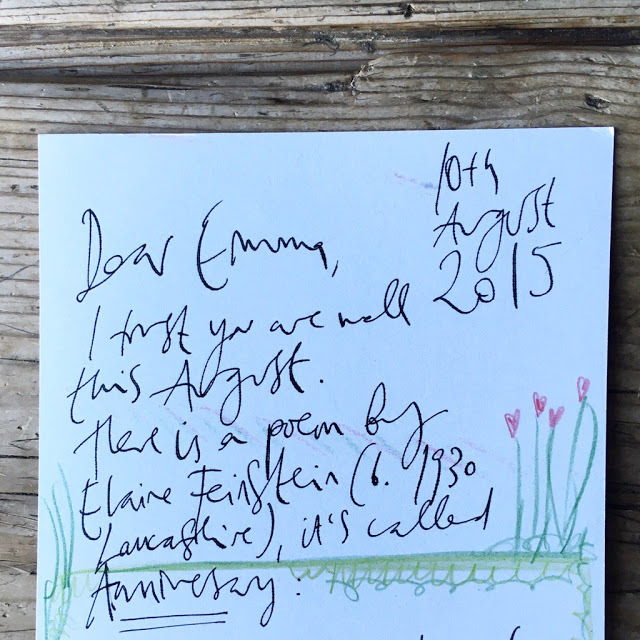 I really love this idea Emma, receiving a handwritten letter these days is such a rare and beautiful thing. When I was a teenager I loved writing to my penpals so I'm very excited to sign up to this project. Thank you for making it happen! Hello Emma, I have a lady I have written to for over 30 years – we met on a plane to NYC when I was 12. It is so lovely to write and receive these letters and I have kept most as each feels as though they are works of art in their own right. So please count me in ! What a great idea. I love the thought of getting something other than bills/mailshots in the post! No fancy handwriting here but hopefully it will be legible 🙂 So regretting not getting that writing set from Paperchase … but I thought "I never write to anyone no more" ! Such a gorgeous idea!! I began writing and sending snail mail again last year, I am a stationary addict but I've always hated my handwriting! So I found a cheery bright yellow fountain pen that actually makes it passable and now there's no stopping me! 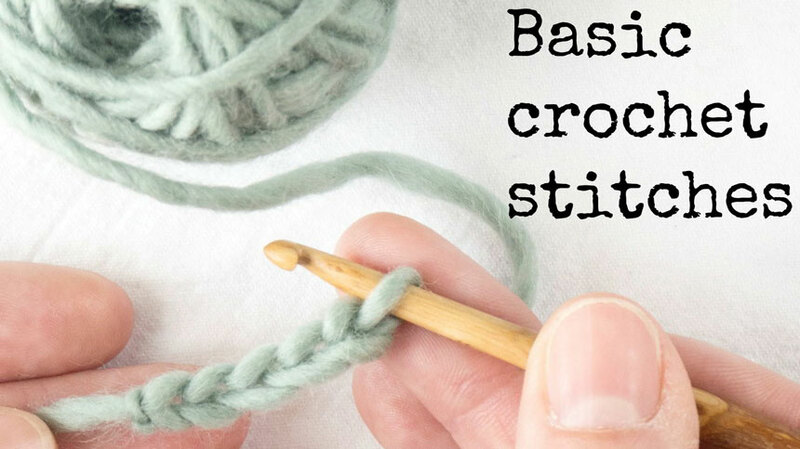 Love the idea of scribing a blog post too! I'd love to write a handwritten letter. I usually write handwritten letters to friends and penfriends around the world.ariadnesky(at)hotmail(dot)com AriadnefromGreece! What a great idea. Love to do this so off to sign up. There is nothing so magical as a letter dropping on the mat. Addressed with known or unknown handwriting. Many moons back I traveled for a year and my then boyfriend, a wonderful illustrator, would illustrate every aerogram he sent. I still cherish them even though BF and I are no longer in touch. I've signed up as it's something I've been pondering on for a while ? What an utterly lovely idea! I host a forum for the ladies who subscribe to my website, we love simple pleasures such as handwritten letters, proper ink on paper, and the like! I'll share it with them, and hopefully we can add a few more numbers to your letter exchange. I've signed up and can't wait! In the past year or so, I've been writing more letters/cards. My hat is off to you, Emma for hosting this project. My Mother and my late sister were dedicated letter writers. Here's to more personal mail/post!! I hope I'm not too late to join in! I only found this today. I so miss the simplicity and true beauty of a handwritten letter to a pen pal. I just wrote about this very concept last week. Great share! Just discovered your blog today, and I missed the letter writing exchange. Do you think you will do another one? If so, I would love to to do it too. I have been wanting to join in with this for a few weeks but missed the deadline. Is there any other way I can join this? I am going through quite a bit of personal turmoil atm and think it would be really good to focus on something different. 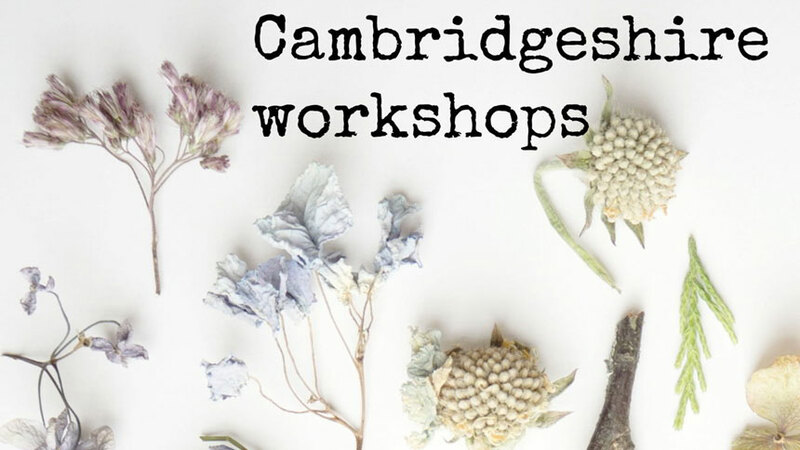 I also did calligraphy and use typewriting fonts and love lots of vintage and artisan things also. Is there anyone on here who would even like to exchange letters. anecdotes etc?